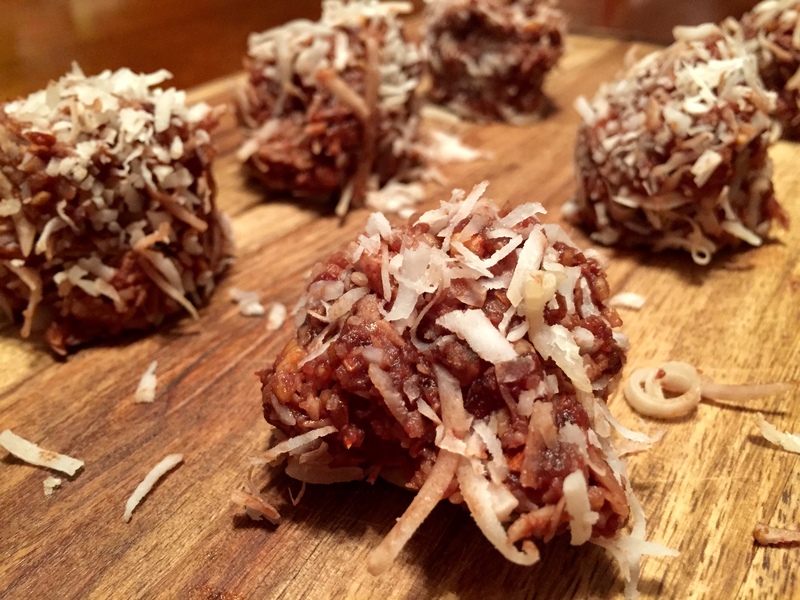 Well, it’s been awhile wince I’ve been on a date, so I decided to have my own date night and make these amazing little Almond Joy Date Bites! These are a far cry from the actual paleo homemade almond joys, but I had a hankering for something chocolate and instead of stuffing my face with the actual stuff, I searched for a healthier option and found these! I had some dates that I needed to use up anyways, so it was meant to be. I got this recipe from Comfy in the Kitchen, and didn’t change a thing! However, I froze my bites, overnight! Now, you know I couldn’t wait to try them right after they were finished (and I did) but I do prefer them frozen. And, I will admit that I didn’t share a single one with anyone – these things were ALL MINE. (Oops.) What more could I want? Zoe, healthy almond joy bites and Netflix. Now THAT is what I call a date night! Add dates, vanilla, salt, cocoa powder, almonds, ½ cup coconut and water in a food processer. Process well until ball forms. Roll into small balls and insert and almond inside . Refrigerate but I prefer to put them in the freezer!